Inspired by the beautiful beaches found in the Philippine archipelago, this stunning necklace features a beautiful mix of natural seashell and crystal stones. Tropical flowers grow everywhere in the Philippines, and this has inspired Filipina artisans Yvonne and Sheila to create this amazing statement necklace. (This particular piece comes in a variety of colors for you to choose from). 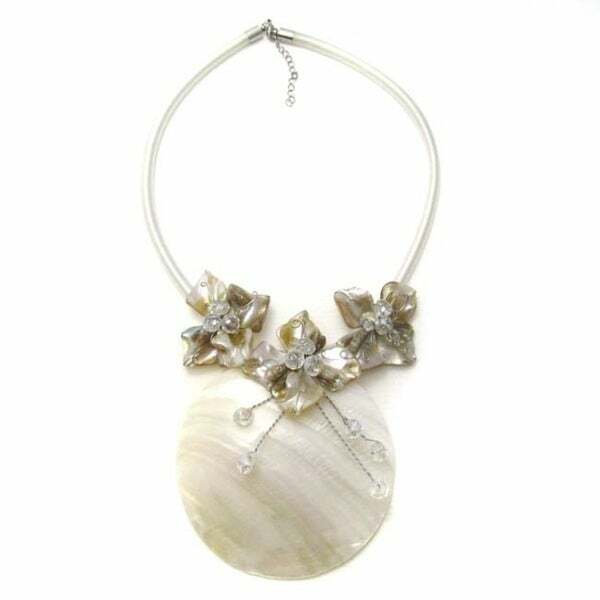 A beautiful medallion of mother of pearl shell is accented with a bouquet of handcrafted tropical flowers. A satin chord is used which measures 18 inches plus a 1.5-inch extension and then finished off with a lobster claw clasp. This truly beautiful and fashion forward accessory will surely add some tropical beach flair to your style. Check out our other listings for other colors. NOTE: Due to the handcrafted nature of this product, minor differences in design, sizing and weight will occur from piece to piece. Pictures may not be true to scale, please check the dimensions for the actual size. Yvonne and Sheila are two young and charismatic sisters who love Cebu Island, Philippines where they are from. Yvonne and Sheila began designing and producing handmade jewelry that focused on using native and beachy material such as unique shells, pearls, wood, beads and coral scattered across the sands. Yvonne and Sheila truly enjoy creating beautiful, unique, and native jewelry.